“Against you, you only, have I sinned and done what is evil in your sight; so you are right in your verdict and justified when you judge” (Psalm 51:4). We never sin in a silo—our sins reach out and touch generations of people who haven’t even been born yet. However the greatest error is that we sin against the Lord who freely gives us all things according to His will. We repent from our past mistakes knowing that God will help us to walk in the right way when we trust in Him. “For I will forgive their wickedness and will remember their sins no more” (Hebrews 8:12). After we have made mistakes and repented of them, we need to receive God’s forgiveness. Many of us struggle with receiving forgiveness because we haven’t forgiven ourselves. However, the Lord desires that His people walk in the freedom that His forgiveness provides. We have a work to do for the Lord so we must receive His forgiveness. “Forget the former things; do not dwell on the past” (Isaiah 43:18). Satan is the mastermind of bringing our past mistakes to the forefront of our thoughts. He tends to remind us right before we are ready to take steps of faith. Yet we must resist dwelling on our past mistakes and continue to speak the word of God to opposing thoughts. The devil and his demons can’t stand the scriptures being used against their condemnations—they will flee. It’s important for us to move towards our calling instead of focusing on our past mistakes. We don’t have eternity on this earth to accomplish God’s will in our season. By letting go of the past and keeping busy with God’s work, we will grow in our faith and be a significant part of helping others grow as well. Sin always separates us from God. We can feel distant from Him just as Adam and Eve tried to hide when He approached them. However, God doesn’t want us to run away from Him—He wants us to run towards Him. He is our Father in heaven who loves us with a great and everlasting love. “For if you possess these qualities in increasing measure, they will keep you from being ineffective and unproductive in your knowledge of our Lord Jesus Christ. But whoever does not have them is nearsighted and blind, forgetting that they have been cleansed from their past sins” (2 Peter 1:8-9). While we don’t dwell on our past mistakes, neither do we completely forget our cleansing from sin. A great and awful price was paid; namely the crucifixion and death of Jesus Christ, for our sins. We must strive towards living a purposeful life in the Lord instead of becoming like the world. God is good to everyone on the earth—the believer and unbeliever alike. Yet when we come to know Christ, we are completely forgiven and cleansed by the blood of Jesus. We didn’t deserve His goodness; therefore, we need times to reflect and meditate on His love, grace, and mercy towards us. Get Past the Past Mistakes! Being filled with the Holy Spirit should compel each of us to move forward to completing the mission of His calling. Getting bogged down because of our past makes us ineffective and a hindrance in ministry. 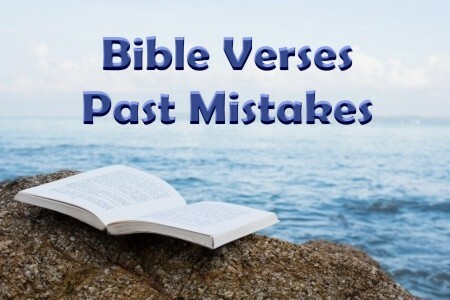 Deal with the consequences of past mistakes with grace and wisdom from the Lord. But get past the past mistakes! Thanks for this article. I know we have to get “past the past” to be effective in ministry and press on. I don’t know what to do though, when I know I’ve been forgiven for the past, but I can’t put the past away, because the consequence of it is a current daily thing to face for the rest of my life. It’s like if a man got drunk and broke his arm in a wreck. If he repents he is forgiven, but the arm is still broke, or, he may still be in jail despite being forgiven, the consequence remains. So what do you do if you did a sin that you know is forgiven, but you don’t know how to deal with the lifetime daily consequence of it that you know will be with you the rest of your life no matter how Godly you live? It is hard to get past something that will always be there for life. Some days it’s not so bad (though daily it’s there and reminds me it’s there, but I try not to focus on it), other days it haunts me knowing it is unchangeable and I just have to learn how to live with it. I would’ve been so much more effective in ministry if I did the calling I should have, and not what I did…I love God but I think I’d love Him more if I could get past this regret, but it is there for life so I don’t know how to just ignore it daily and press through. To me, it is my version of “Esau’s soup,” and no amount of tears will give me back the “birthright” I gave up for that temporary soup, that is bitter in my stomach for the rest of my life. Thanks and God bless! Prayers welcome. Hello Mr. Glass. I want to suggest you read something called “How to Forgive Yourself” at this link my brother and don’t lose heart. I see your faith is resilient. http://www.whatchristianswanttoknow.com/how-to-forgive-yourself-a-christian-commentary/ I really think this may help….prayer for you sir. I’ve met several people in the past few years who have refused to allow their past to hold them back. Are they affected by consequences of their past? Absolutely; however these people had enough faith to trust God and allowed Him to guide their lives. They also stopped surrounding themselves with people who kept bringing up their past. Each of us has a past. It’s ultimately up to us to determine whether we will allow the past to affect our future. I also feel held back by the trauma of my past ,the sins of my youth and feel deeply affected by the mistakes made years ago,I question my life now and sometimes wish for an end to it all, how wrong to think like this knowing that life us a gift fromGod but not being able to live beyond this is a bit much sometimes . Hello Mr. McCullough. There is no amount of sin or no sin so grievous that God will not forgive through Jesus’ shed blood. Have you talked with your pastor about this? Don’t give up hope or put a period where God wants you to have a comma. I am praying for you sir. What do you do when others are hurting from mistakes youve made in the past? Not only is it hard to forgive myself but its even harder when those mistakes and regrets are continuing to hurt others because they cant be taken back. How do you move on from that? To roman catholics: Forgive yourselves of past mistakes, be real repentant and contrite and go to sacramental confession. Peace and joy be yours. Amen. I battled chronic pain for two years and was in the middle of my breakthrough when I lost it. I had failed warnings and missed directives because I wanted comfort from people not Christ. This cost me ALOT! I’m still trying to get better and hope Jesus will create a way again…I know God wanted to used me so much more but I allowed distractions to keep me…looking back I would give anything to hold onto my breakthroughs and not find validation in people but only in Christ. Next post: Science and Christianity: Conflicting or Compatible?